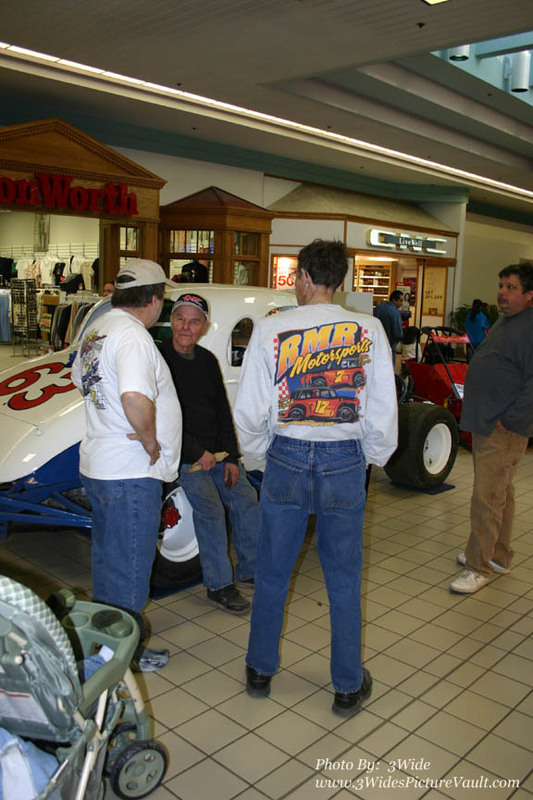 Speaking of Bob Travagline, that's "Bounty Bob" (#71X) on the right talking with strong late model, then dirt sportsman... then asphalt racer #17BPhil Cox. 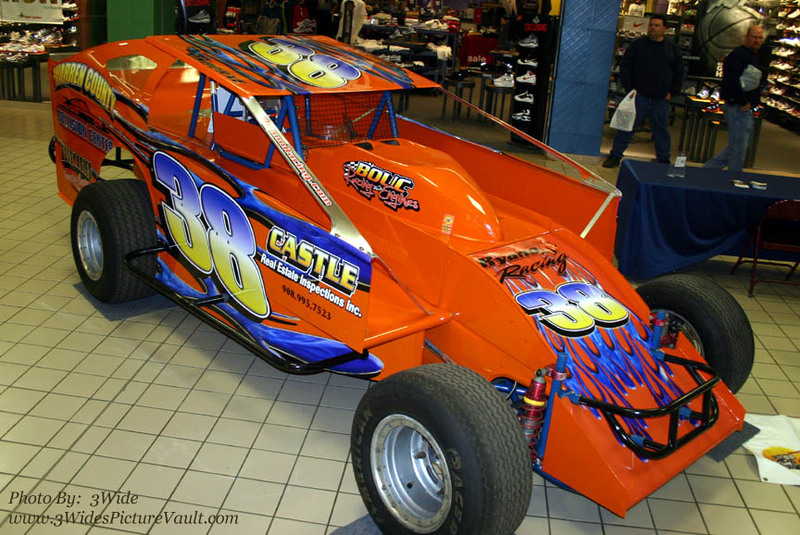 Gary Butler is all set for 2010 with a small block and a big block... Only problem is that I can't remember which is which? 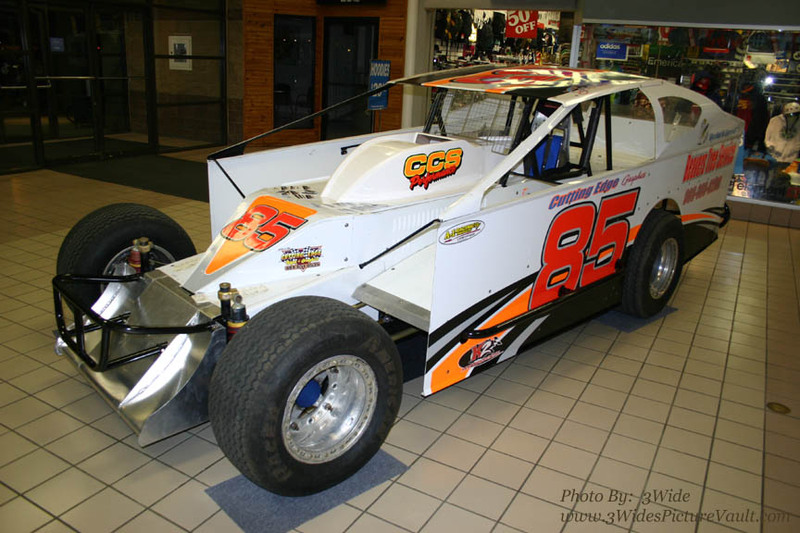 Strong runner in the red #68 Late Model class at Flemington, Gary looks to have one of his best years in the modified division at New Egypt Speedway in 2010. 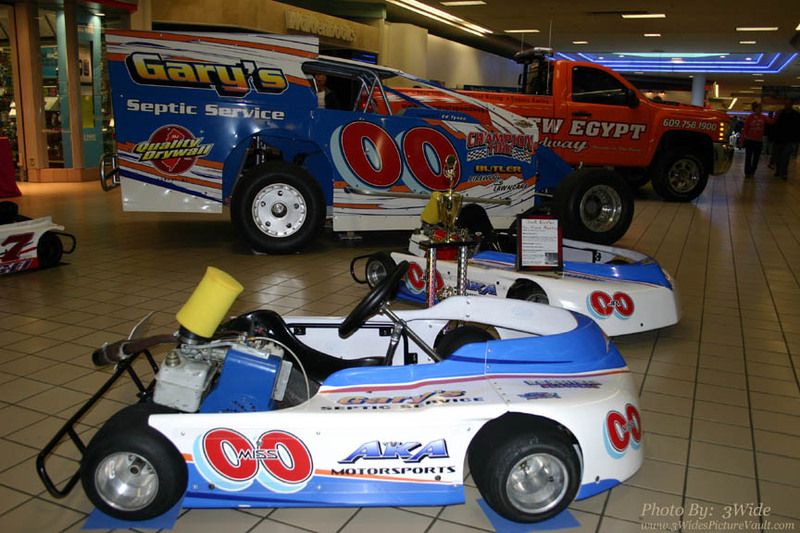 Gary's daughter Allyson #MISS 00, and son Jack in the #00Jr run Karts with the same color and # scheme. 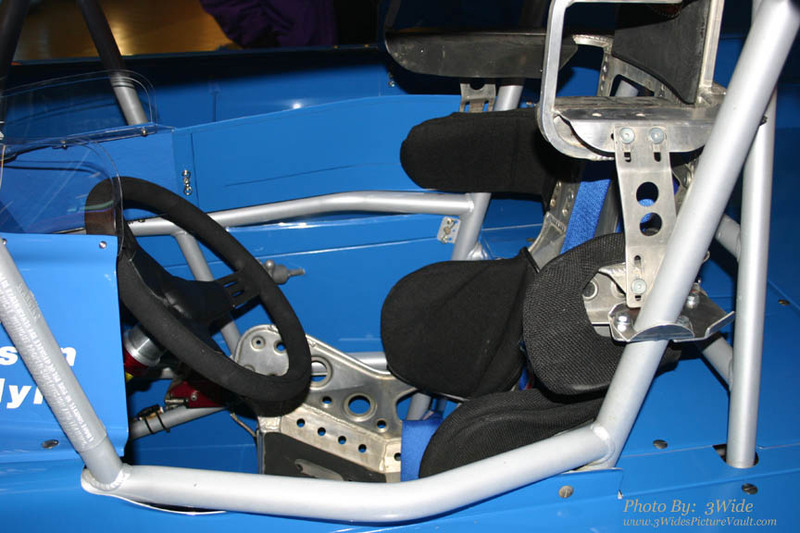 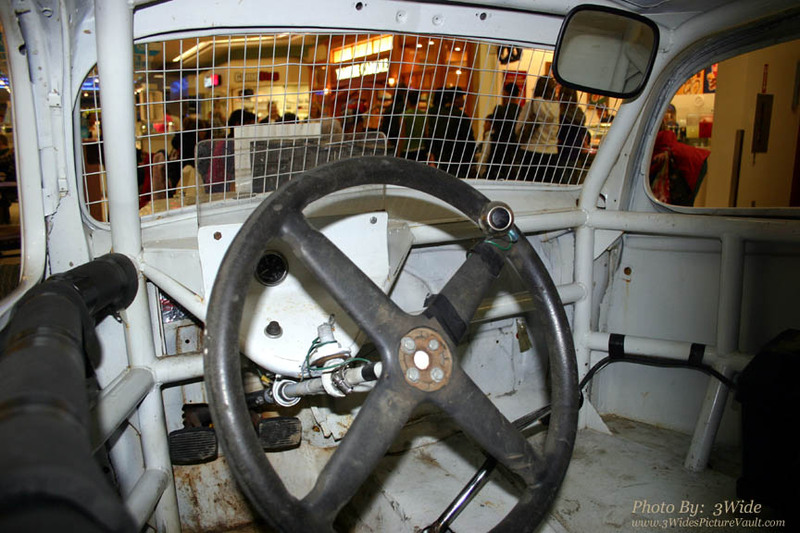 Great to see the safety improvements that have been made inside today's modifieds. 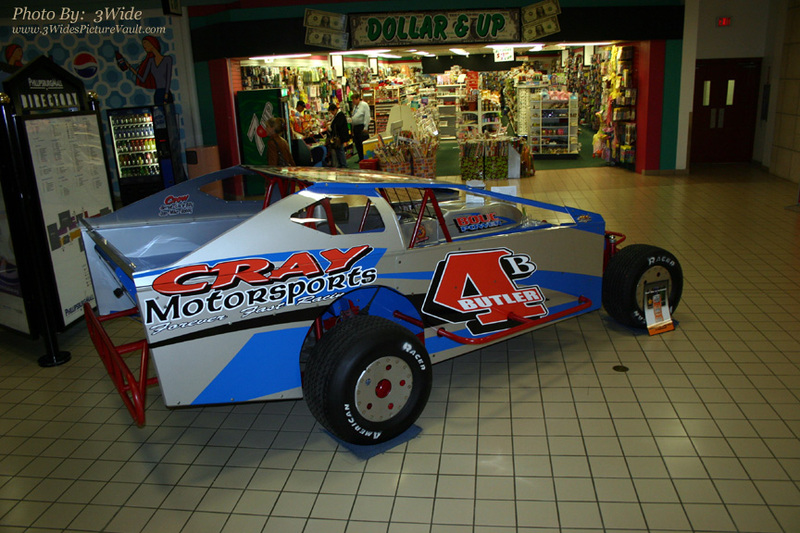 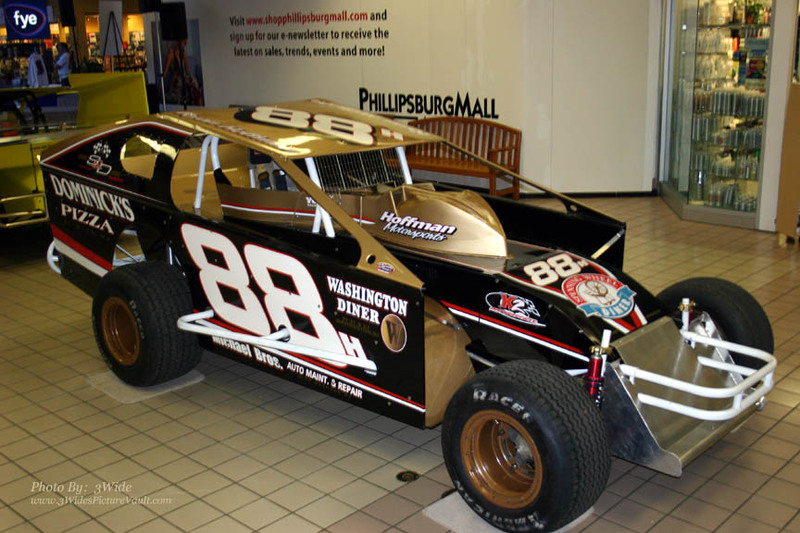 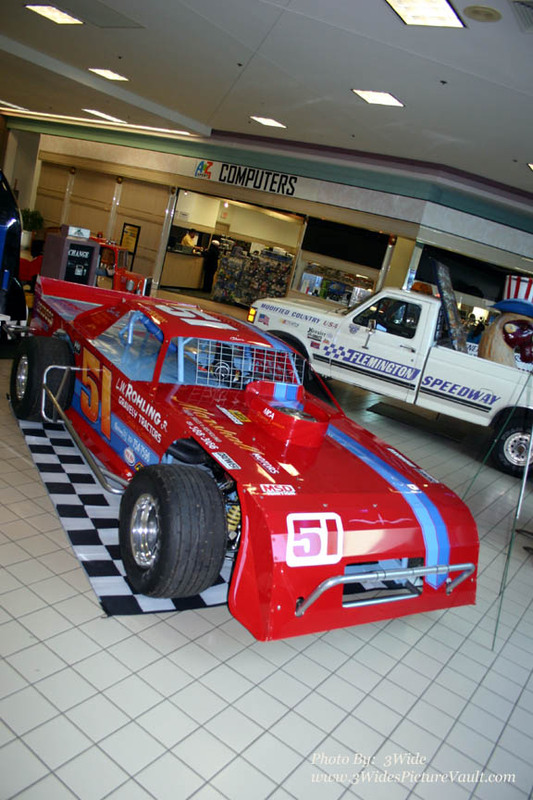 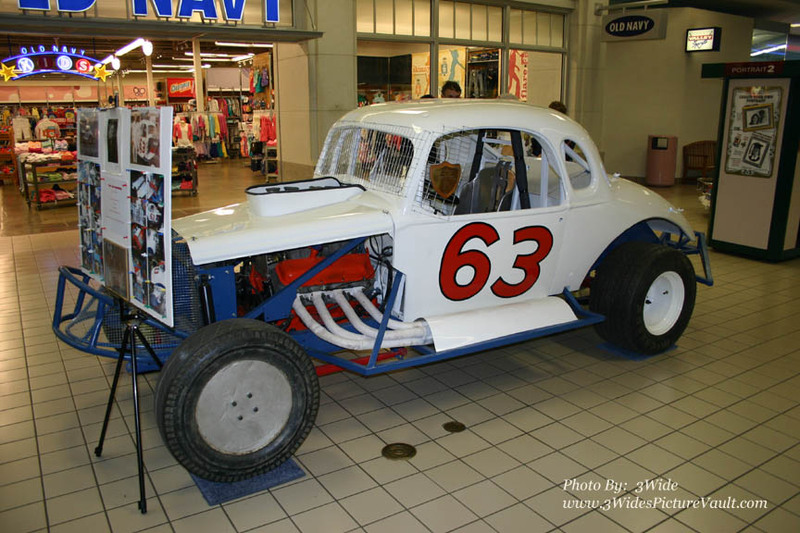 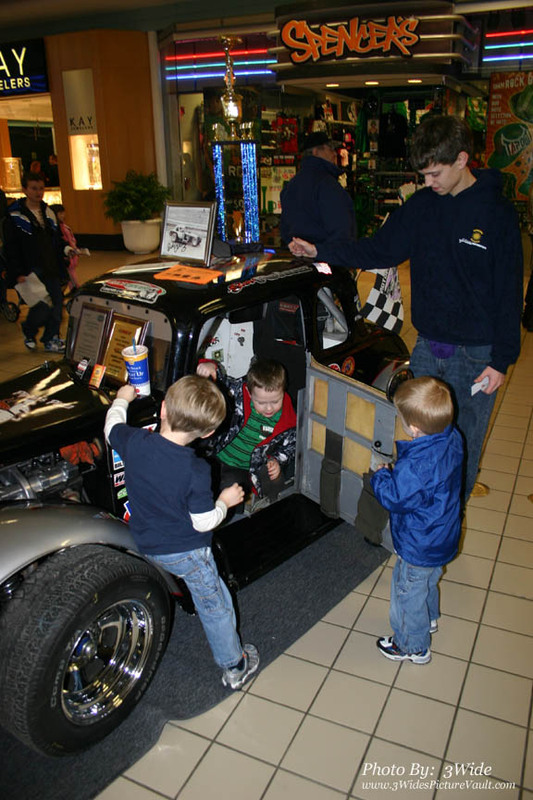 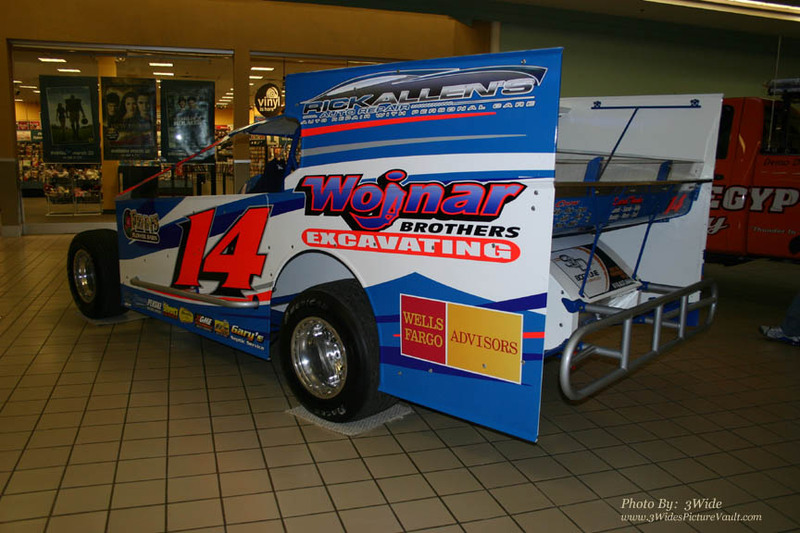 Ryan Polenz Legend car was a favorite of the smallest of fans, once they saw that it had a door that worked! 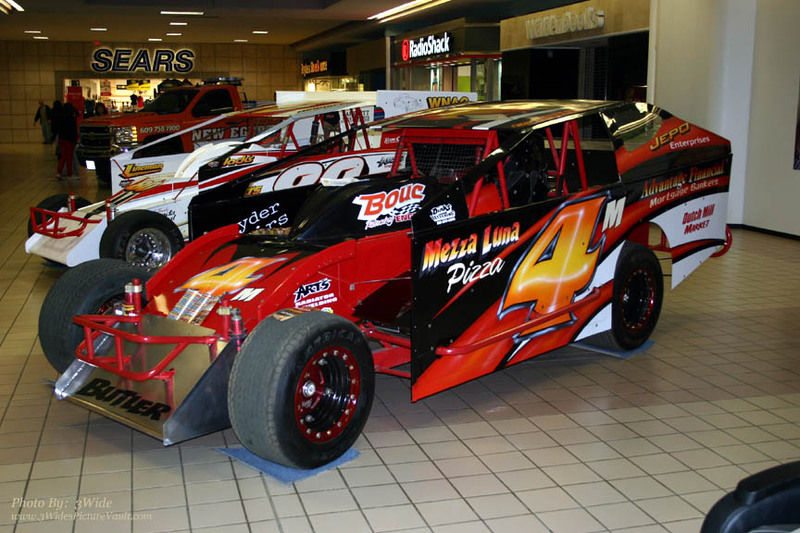 Good to see the entire Polenz team on hand. 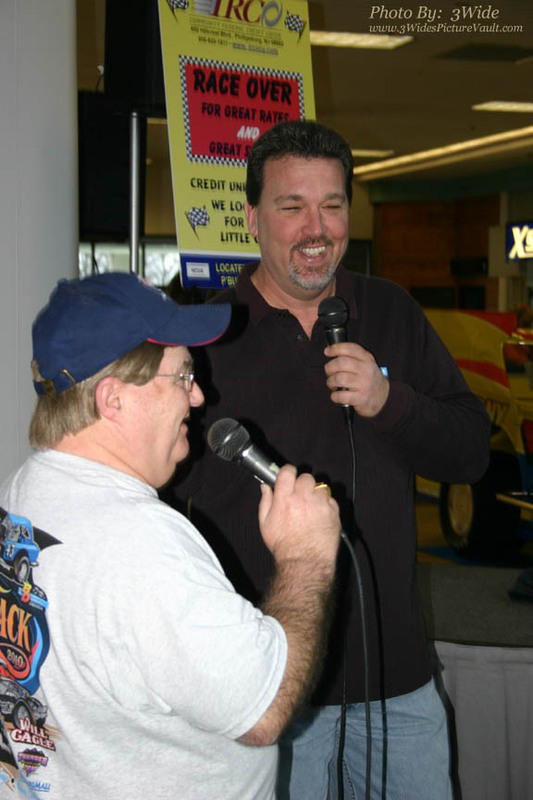 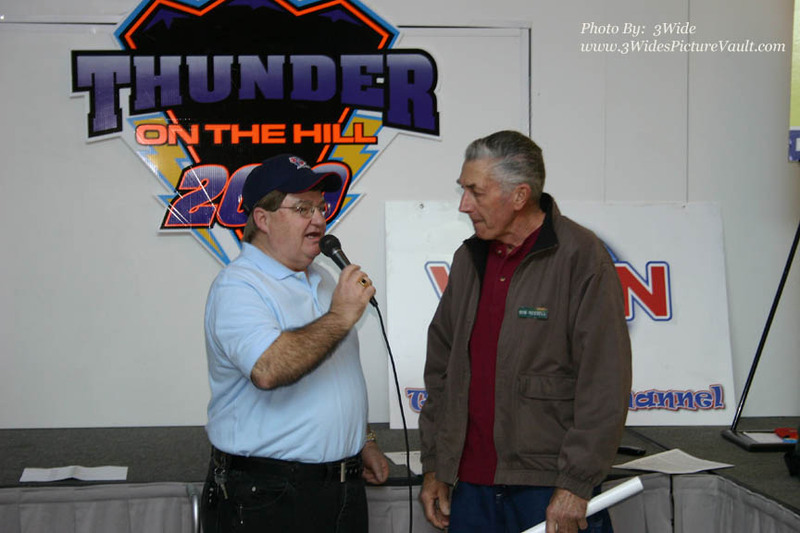 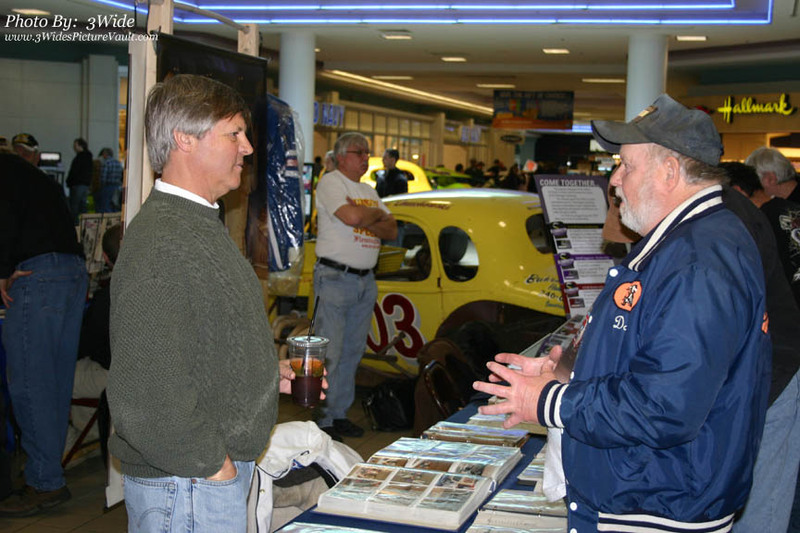 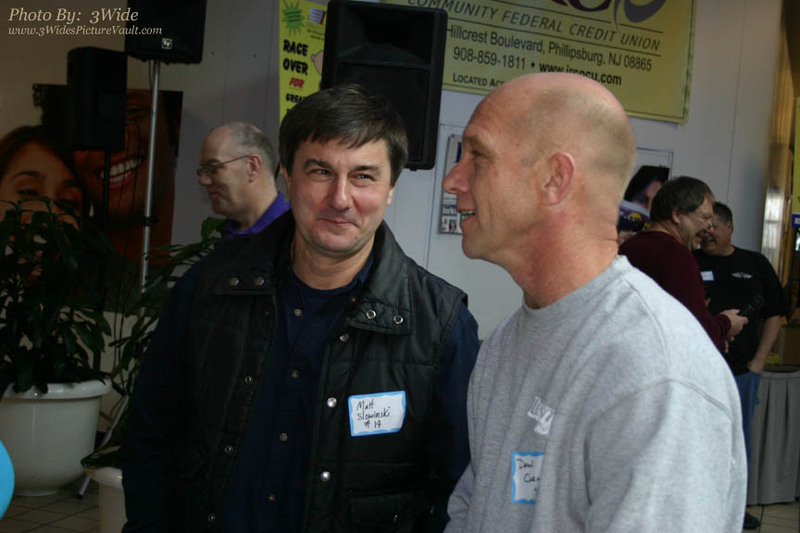 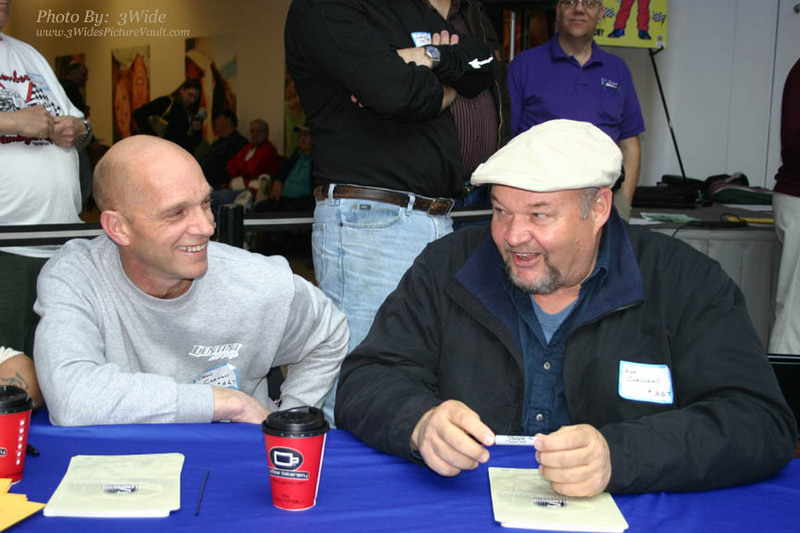 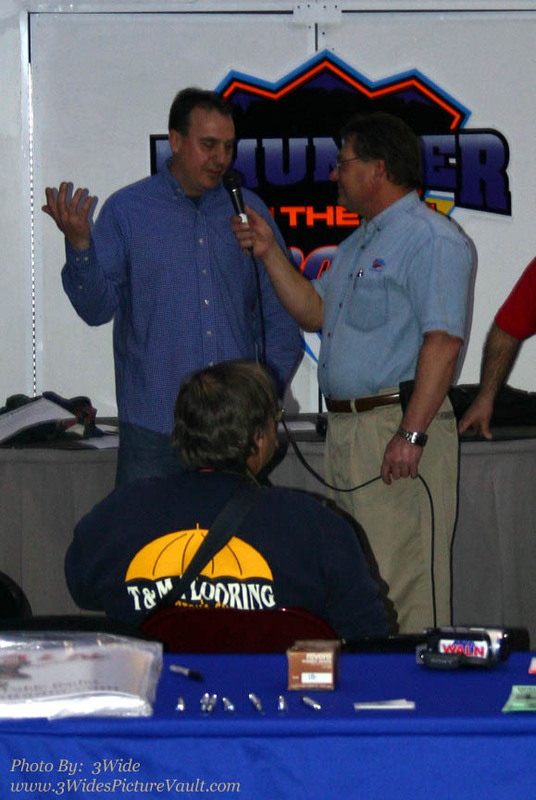 Program Dynamic's Steve Barrick chats with Flemington Sportsman competitor #2 Dave Gunther at the Flemington Speedway Historical Society booth. 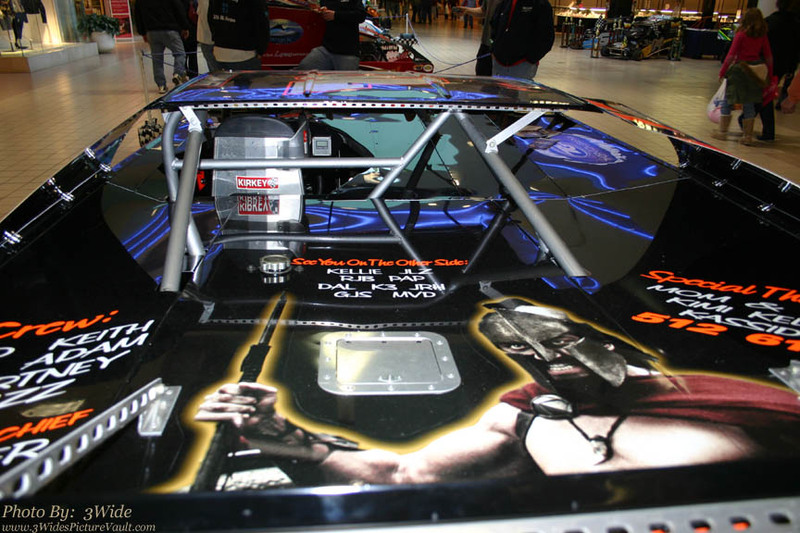 We liked the looks of them all, but really liked the body work on the Hager Falcon #43. 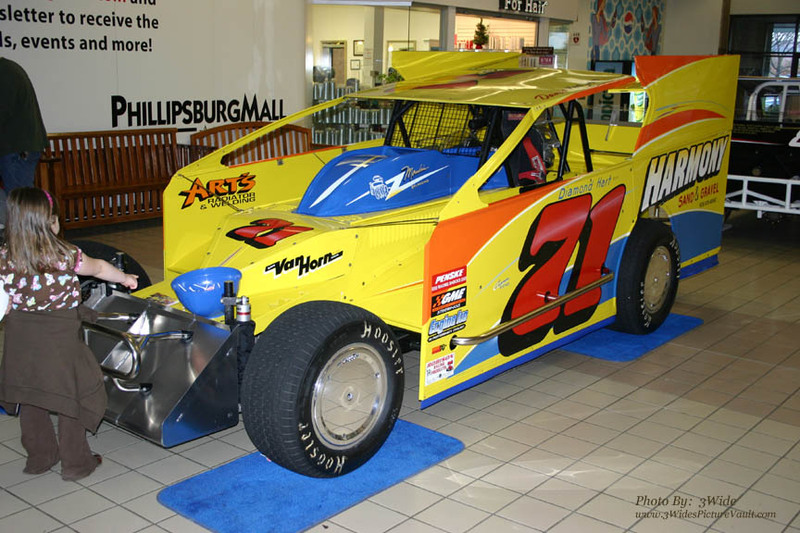 Speaking of cool looking Falcon's... 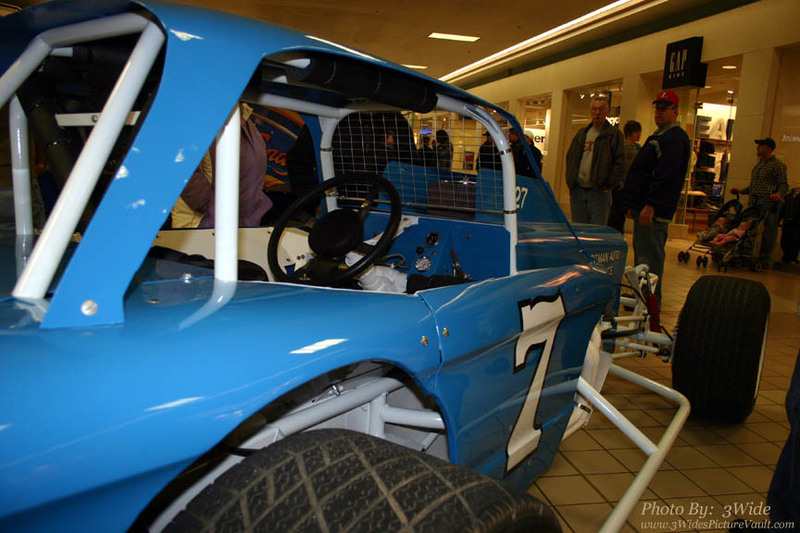 Here's Jim Biehl's #7. 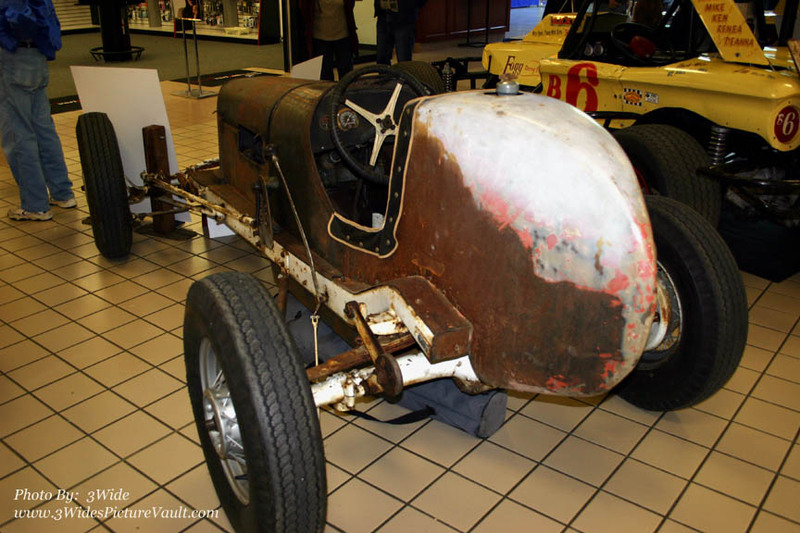 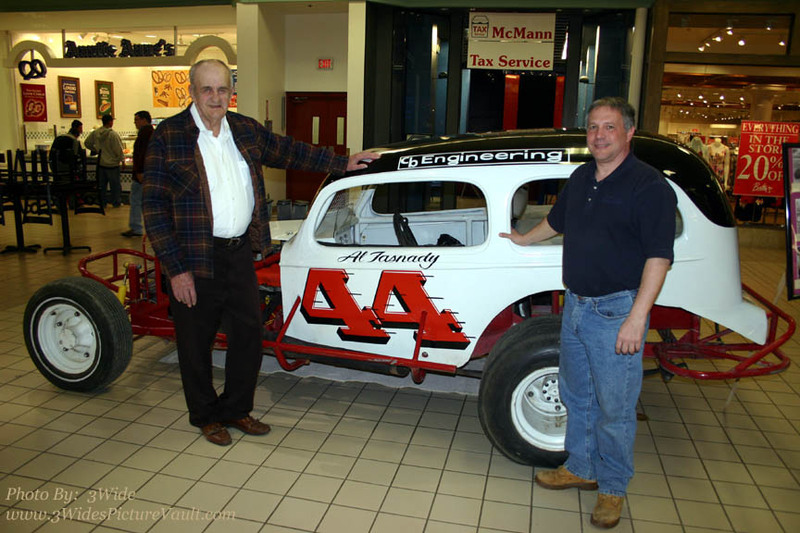 ...With all the time and effort putting into restoring old racecars, and getting them out where they can be seen, this might be the most important reason why! 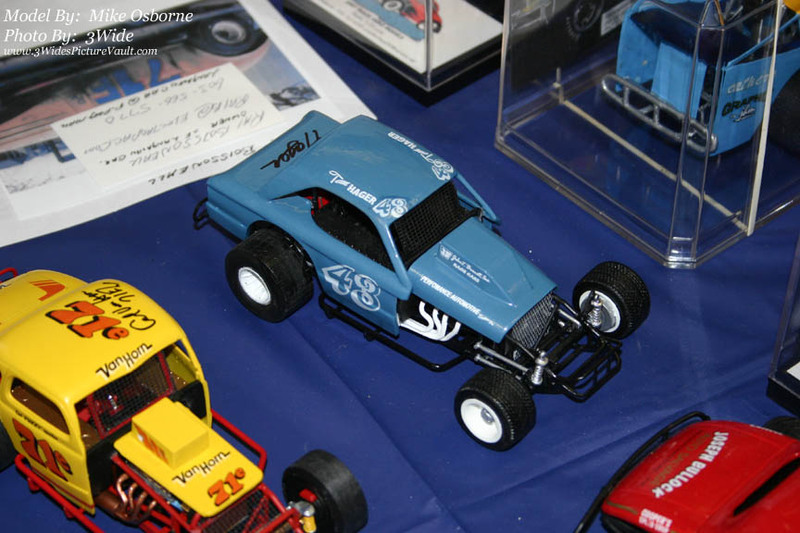 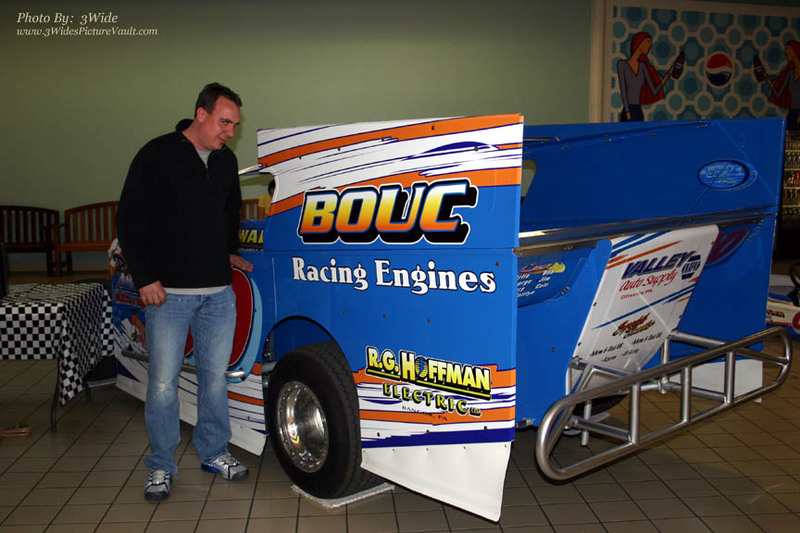 Looks like the #B6 has a small block, and 70's Modified Driver #07 & #3aWyatt Jacobus under the hood! 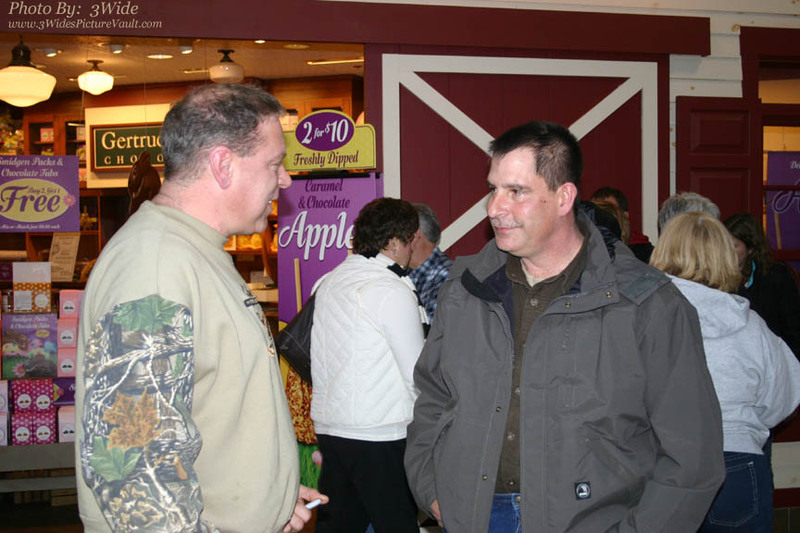 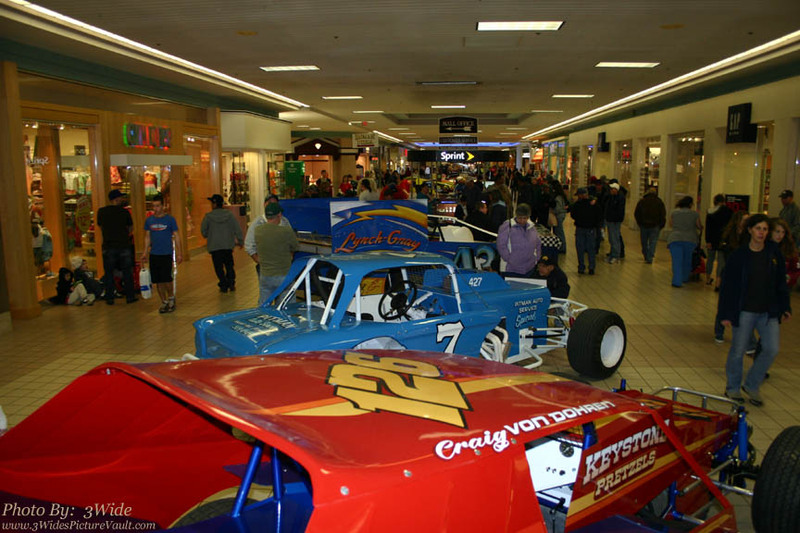 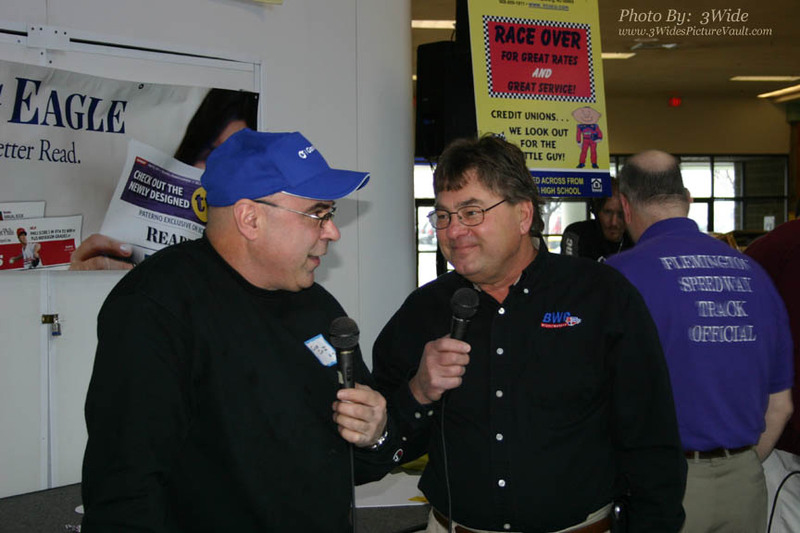 That's it from this year's Phillipsburg Mall Show - Great people, great conversations... Great job by Brett Deyo, The Pados' Brothers and IRCO Community Federal Credit Union and everyone who was involved in making the show happen. 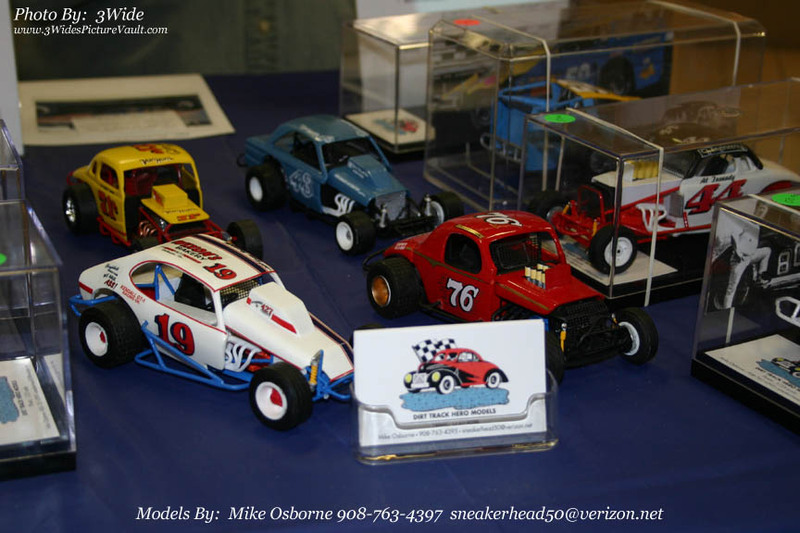 Also, thanks to all those who made arrangements to have their cars on display. 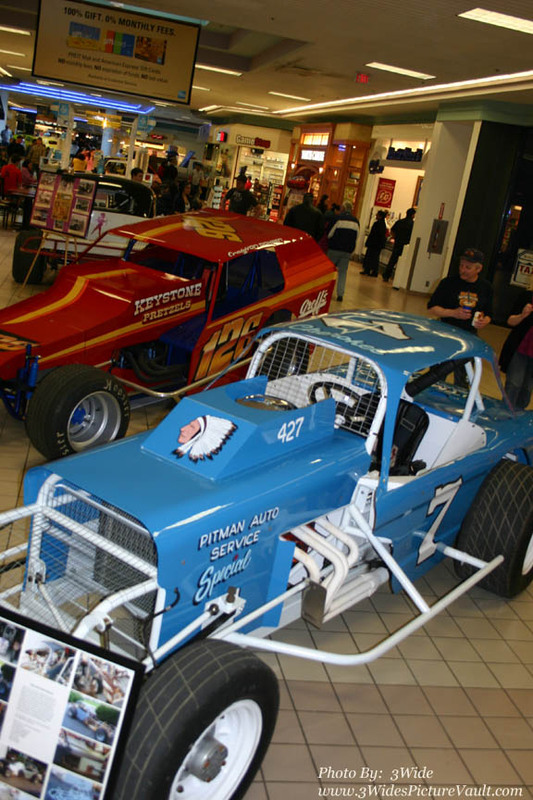 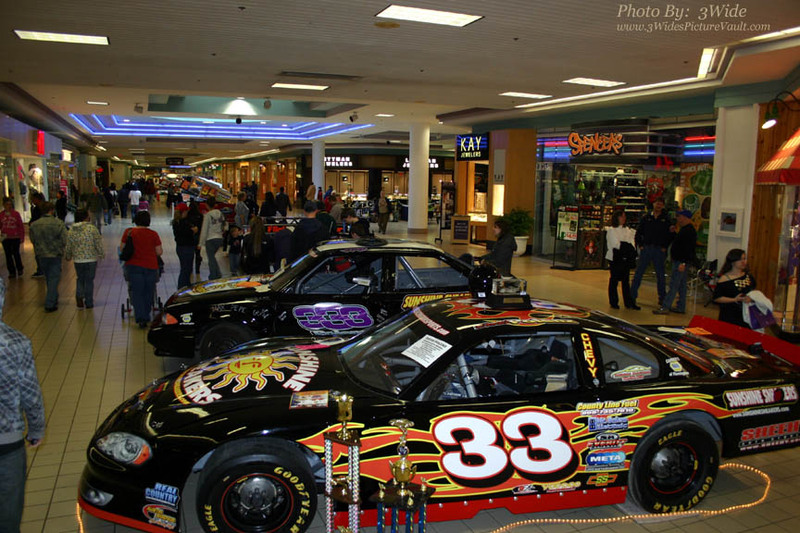 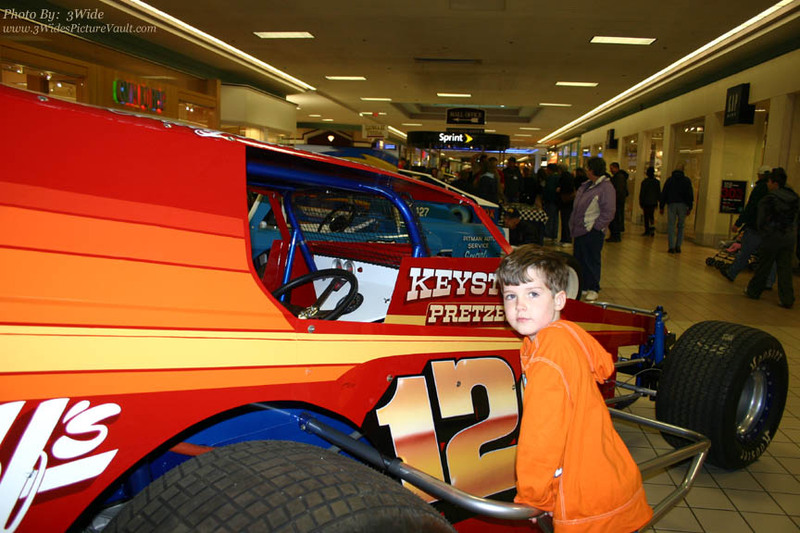 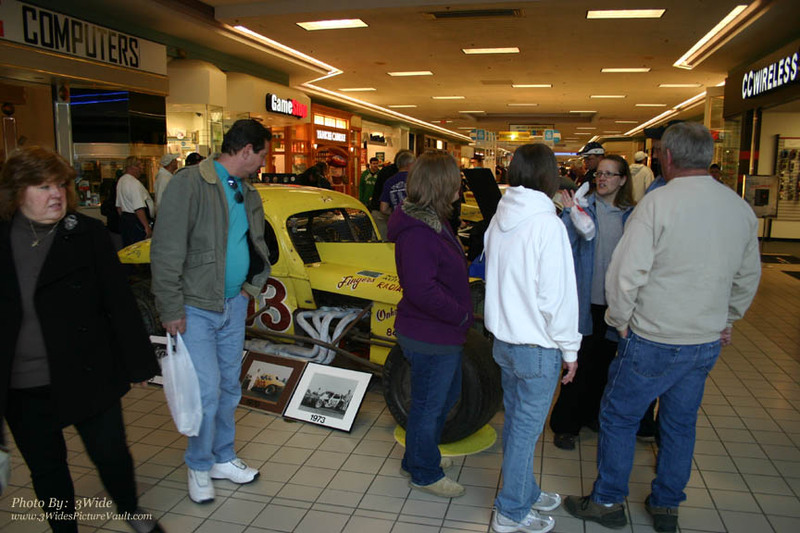 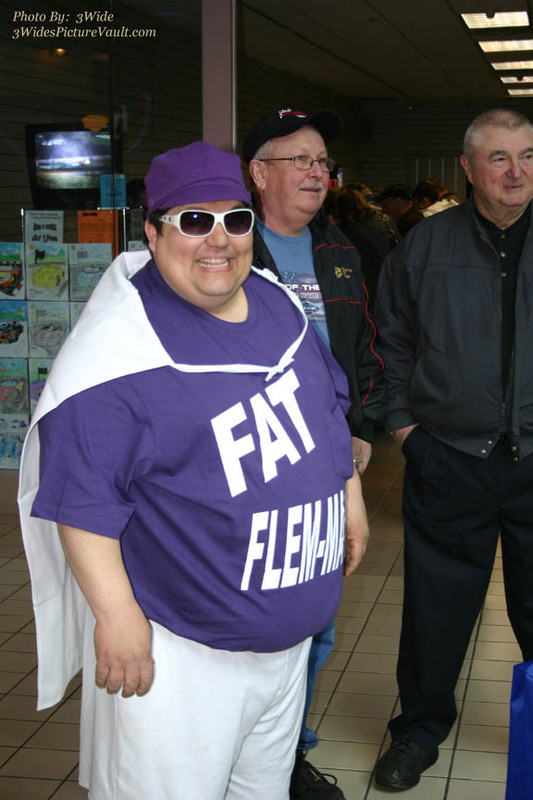 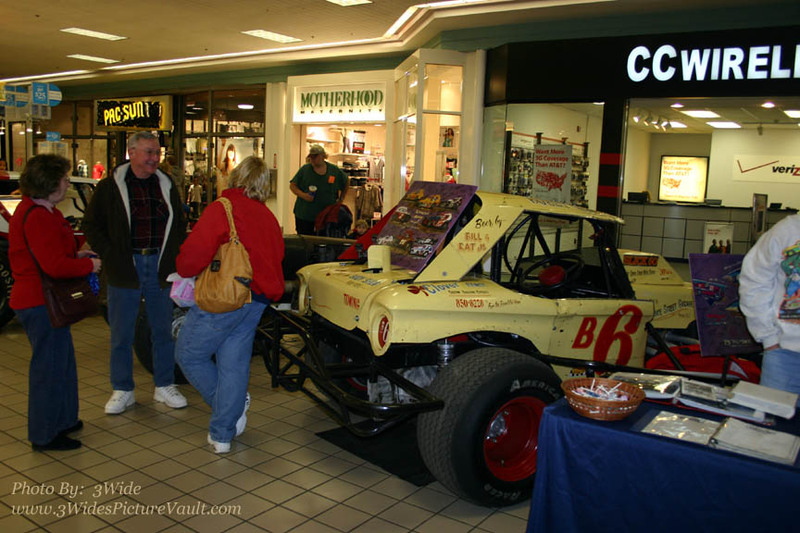 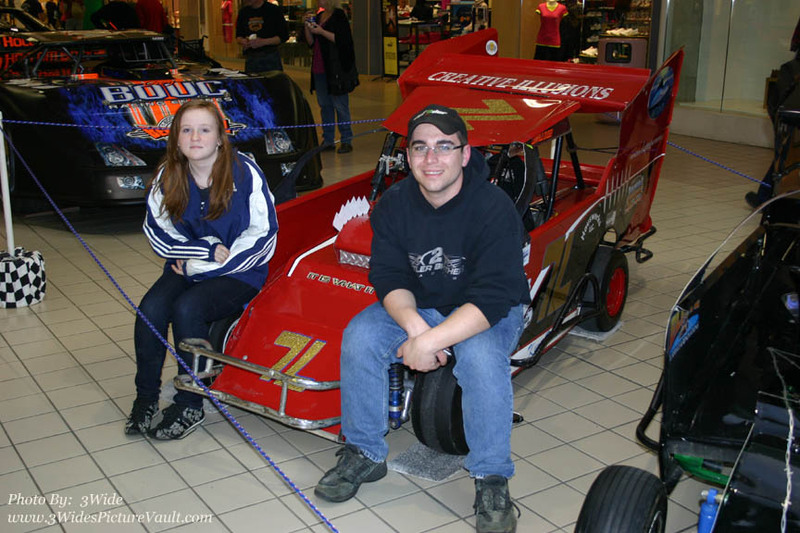 Now that the shows are over, be sure to get out and support your local speedways in a big way in 2010! 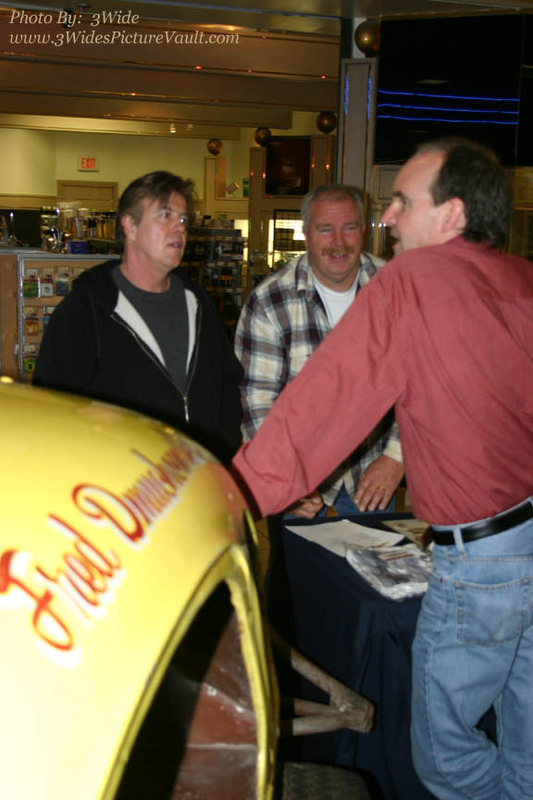 ...Speaking of Bob, we got to say hello - That's him behind his original Falcon. 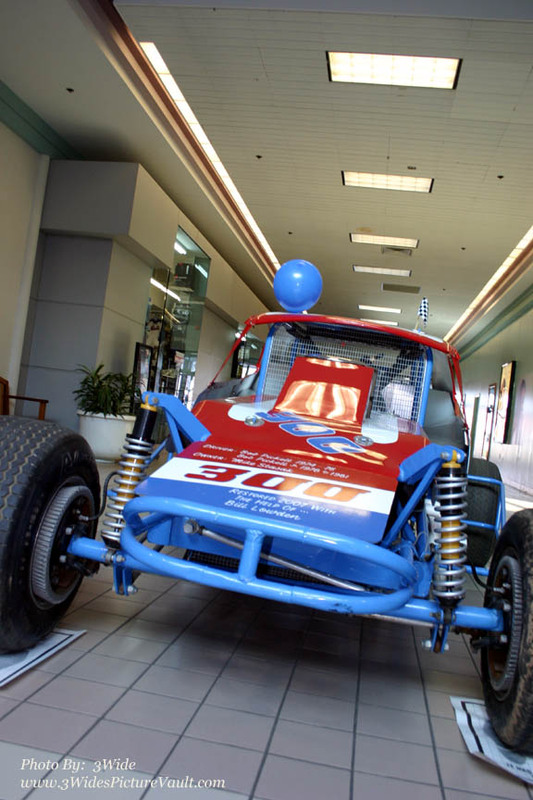 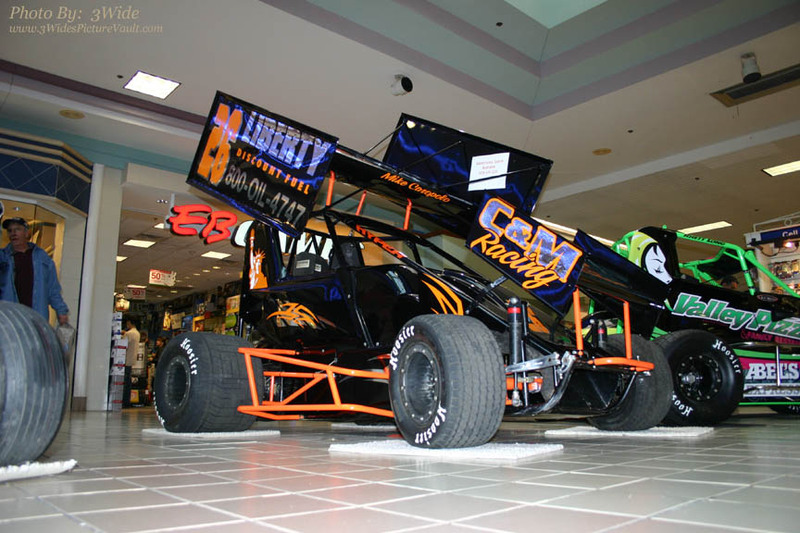 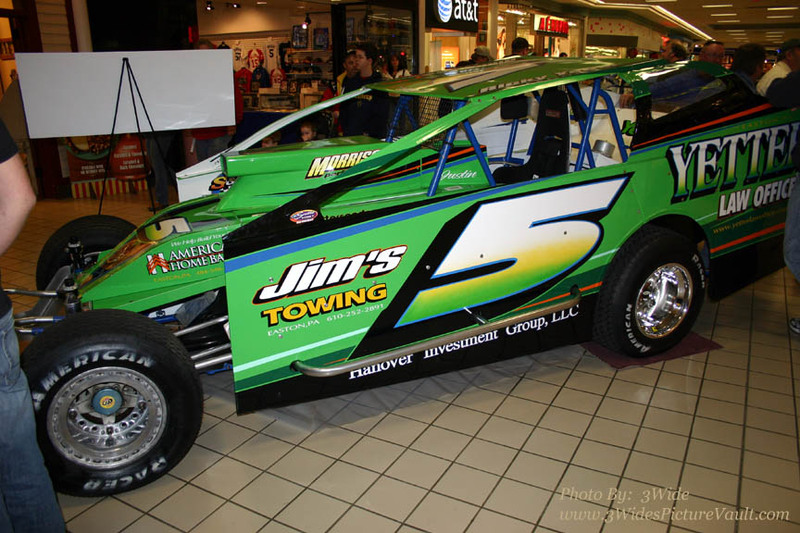 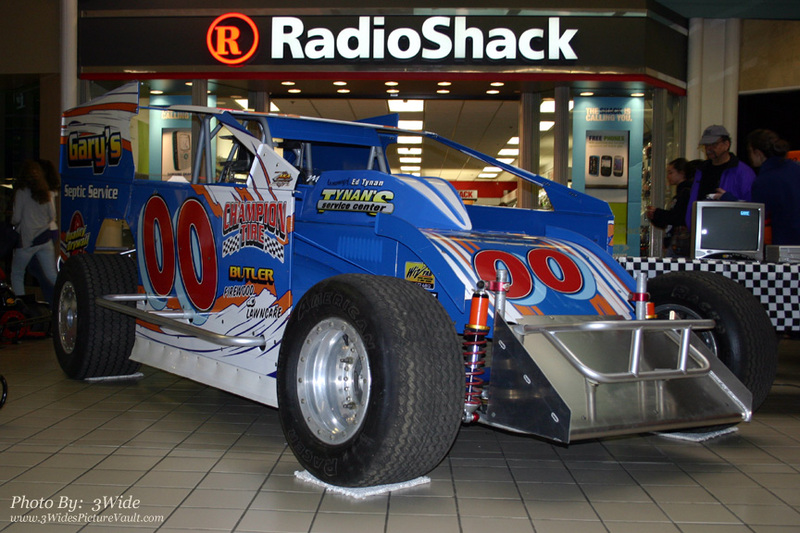 Not sure who pilots this one, but we're pretty sure that its headed to New Egypt in 2010..
... Big thanks to show sponsor IRCO Community Federal Credit Union - Support those business that support our sport... Give IRCO a call at: 908-859-1811. 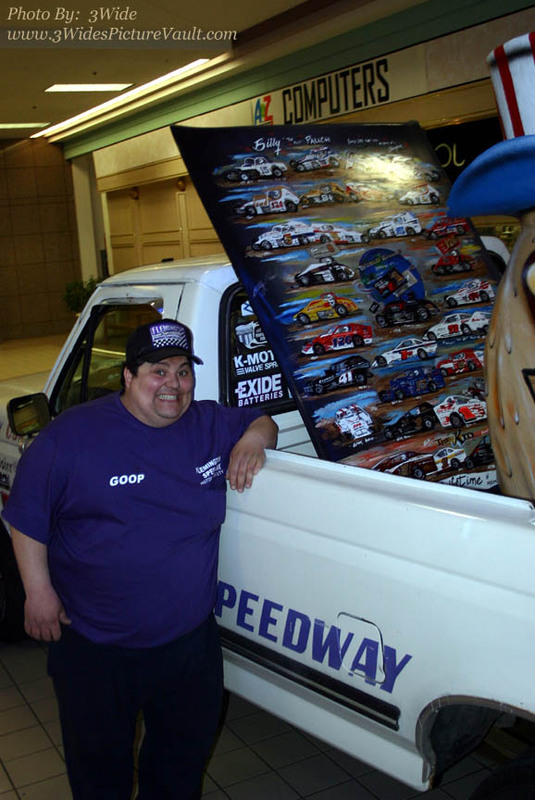 Check this out... Goop had artist Clark Angstadt create this unique work of art featuring many of Billy "The Kid's" rides, painted on the roof of a Modified! 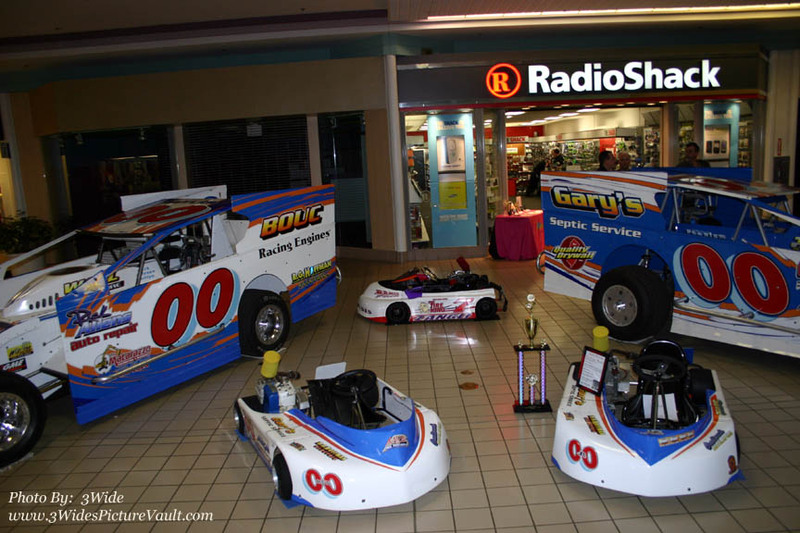 ...3 Wide at Phillipsburg Mall. 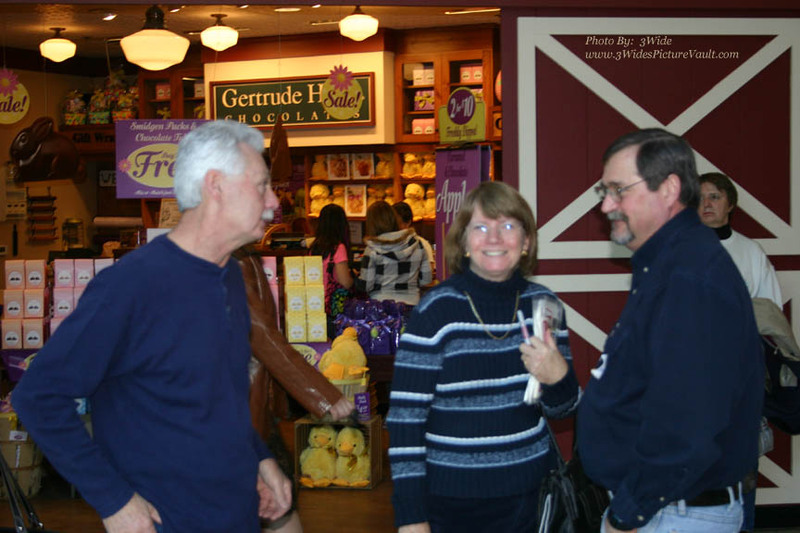 Newt Hartman and Fred Dmuchowski looked like they were talking about some #24 and #303 moments... That's Fred's wife Patti in the center. 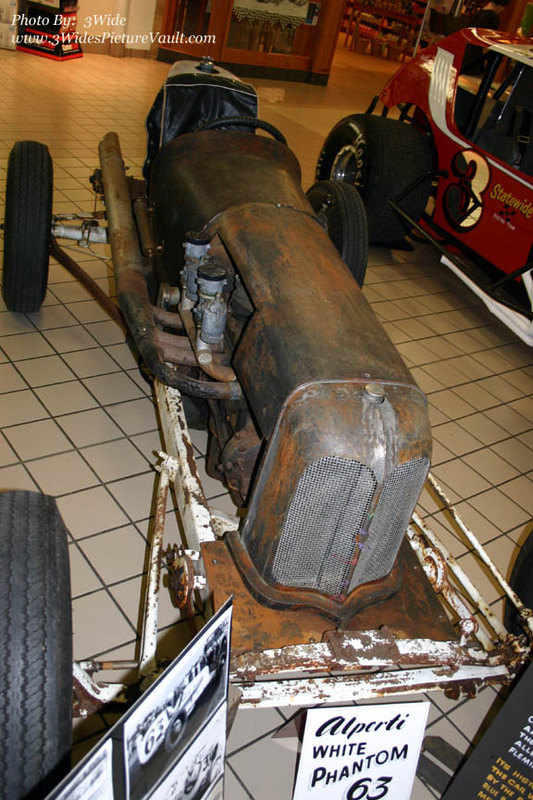 ...The owner is looking for additional information on this car... 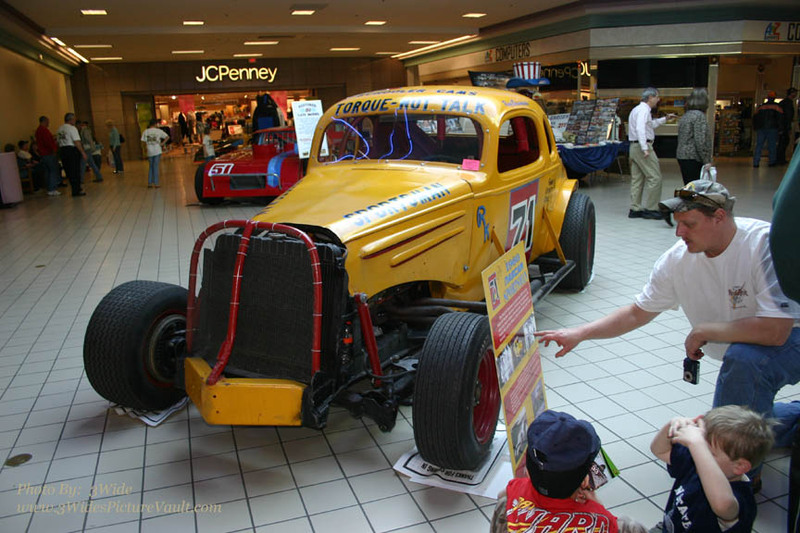 It's an original for sure! 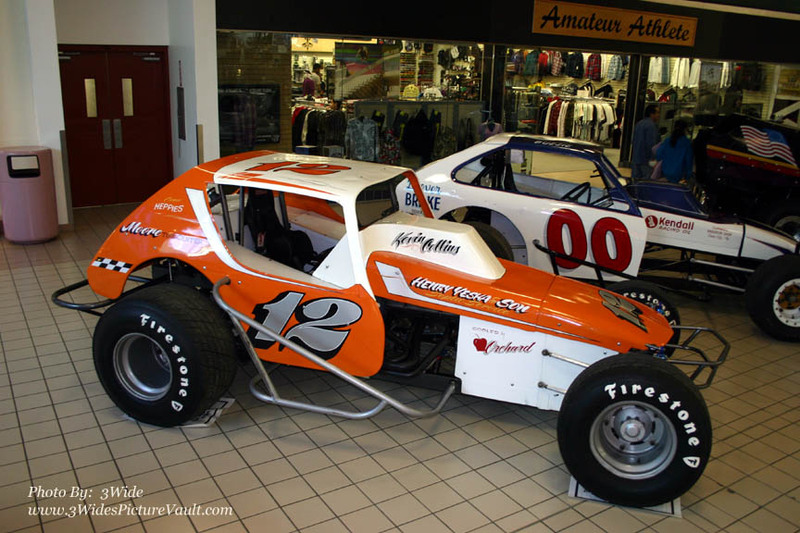 Jim Biehl's #7 and Kevin Eyres #126... Great looking vintage rides..
Gary Butler has small block and big block power... and if they don't work out, I guess he can give one of the Karts out front a try! 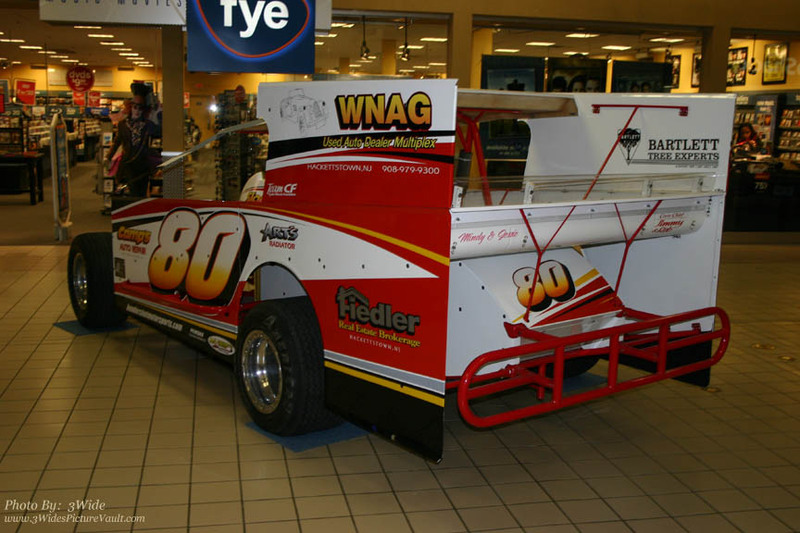 Mike Hendershot's #80 will be easy to see... 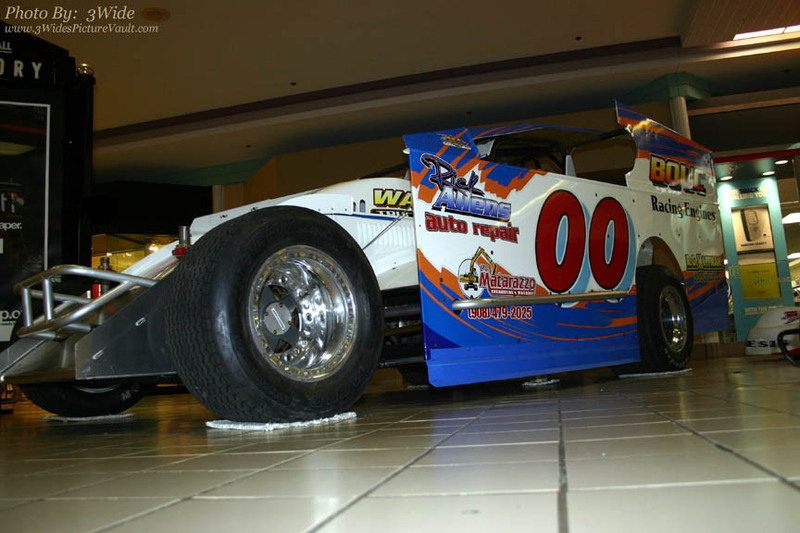 The white red and orange will look great on the track and it'll look great in victory lane in 2010 too! 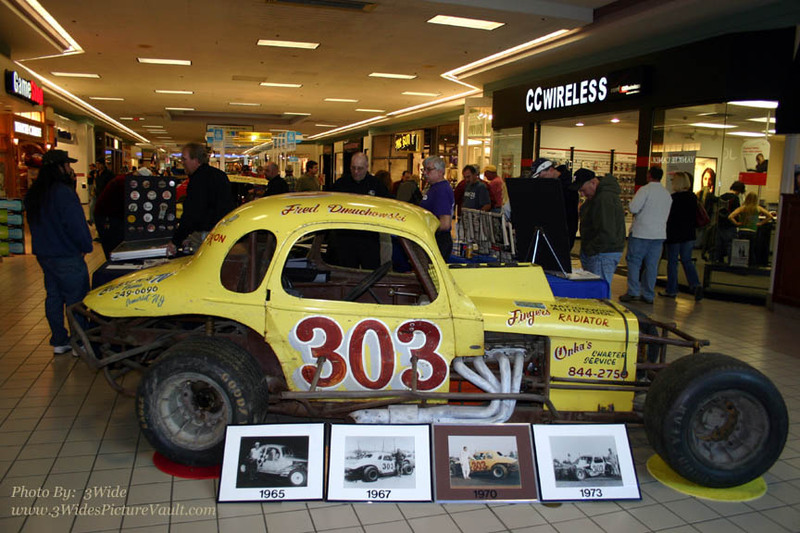 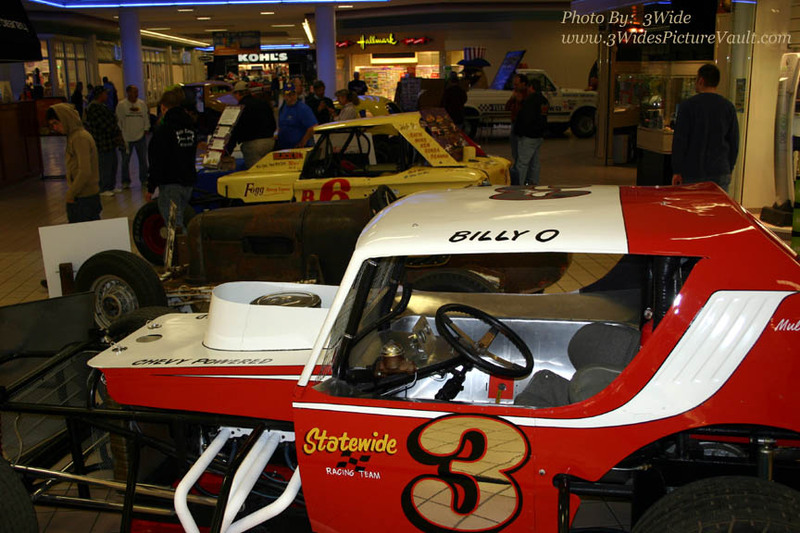 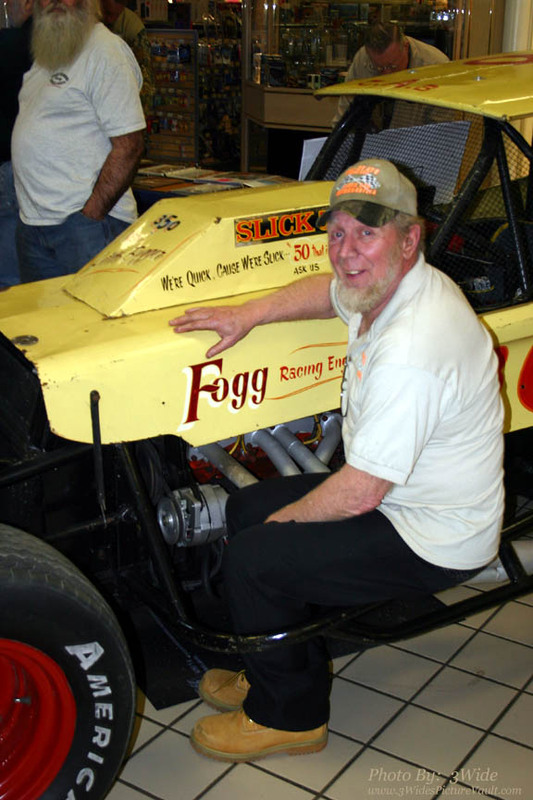 Note: For those heading up to the show this week, be sure to stop by either the Flemington Speedway Historical Society (FSHS) booth (near JC Penney's), and/or by Bob and Dale Snyder's Photo and Video booth (directly across from center stage) and "sign in" for our 3Wide's Picture Vault T-Shirt Giveaway. 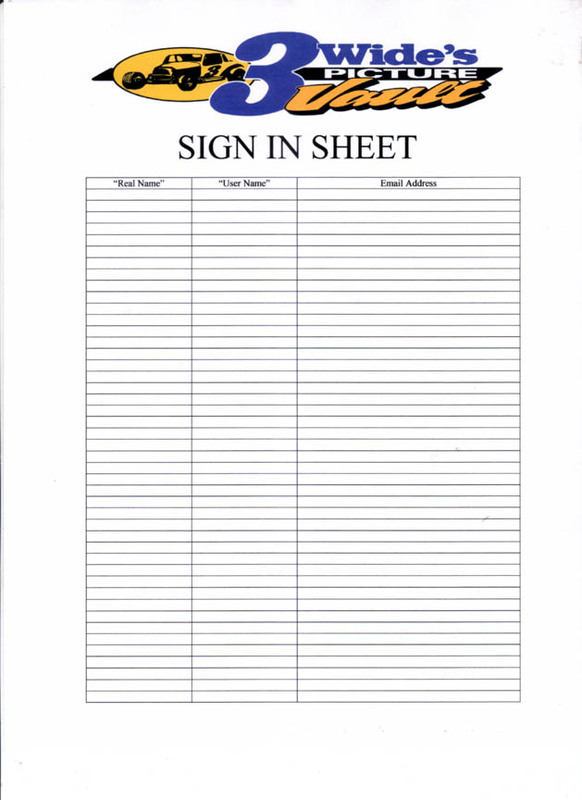 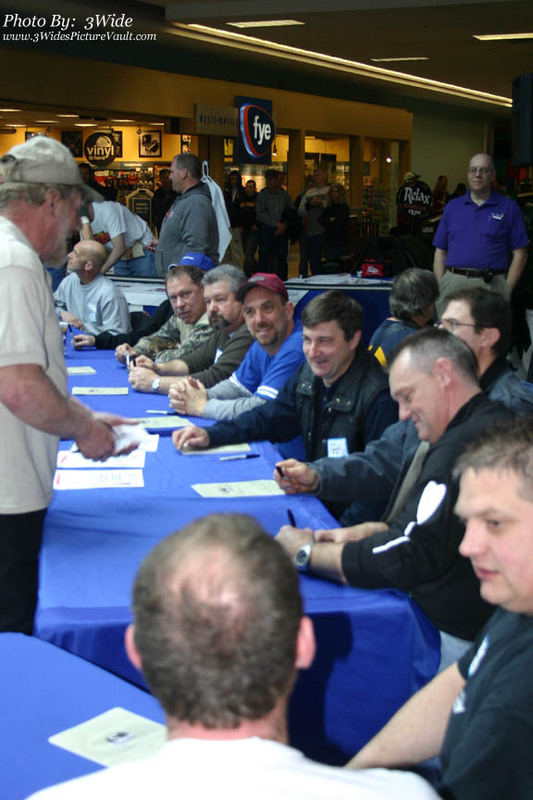 Sign in anytime between now and Saturday at 8pm and we'll pick one winner from the FSHS's sign in sheet and one from Bob and Dale Snyder's sheet. 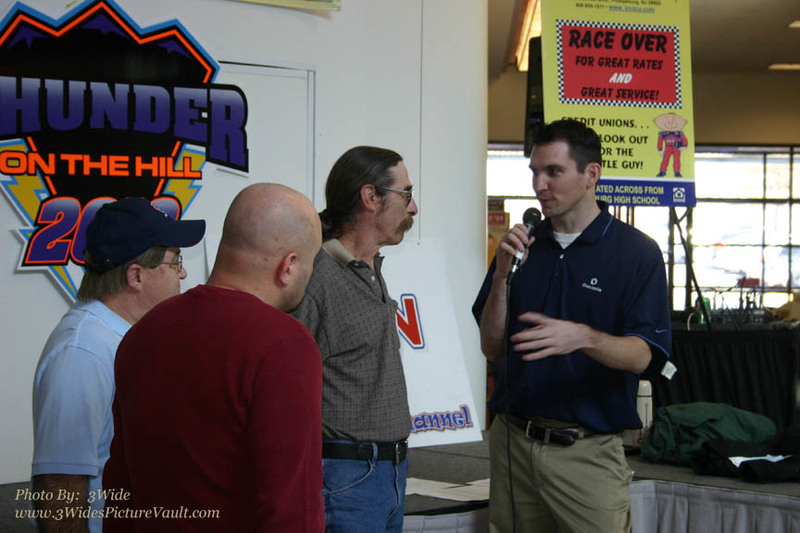 We'll notify the winner by email, and then you can let us know your shirt size, and where you'd like the shirt to be sent. 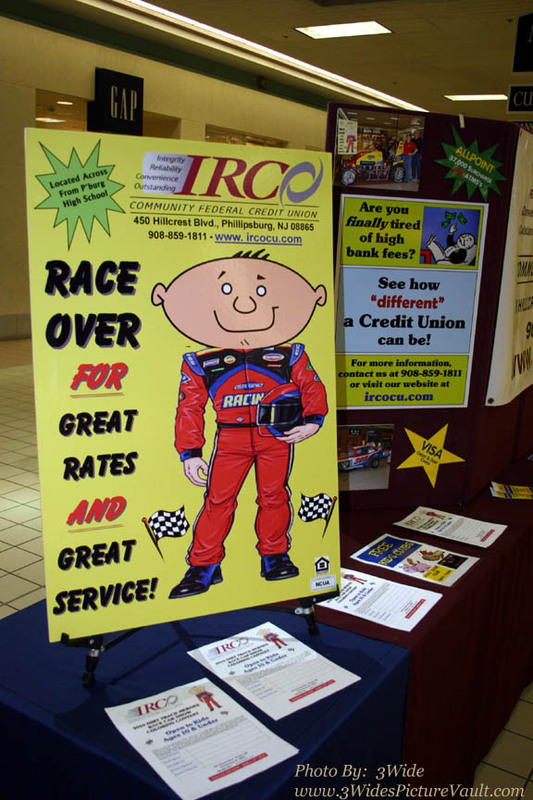 Stop by and sign in at the FSHS and/or Snyder's Photo & Video booths anytime this week before Sat, March 13th at 8pm!